No physical tickets: Your New SKIF Ireland Licence with Photo will be used for entry to events. The only exception to this rule will be outside visitors from other organisations. If your club has not yet received the new licences, we can enter you manually. Club Payments: Club Instructors must submit a spreadsheet of names and single payment to the treasurer in advance of the course. Students new licences will be scanned at the door to record attendance. Black Belts and Club Instructors: Black Belts and Club Instructors are encouraged to attend all sessions and Club Instructors are encouraged to attend all Kyu Class Training in their area. This seminar we will have 3 Black Belt Instructor Classes. This is at the request of Murakami Shihan and all Club Instructors and Assistant Club Instructors are encouraged to attend. Dan Grading Applicants: Dan Grading Applicants must pay the full applicable course-only fee in addition to any Dan Grading Fees and attend as many classes as possible. Non SKIF Ireland Visitors: Visitors from other organisations are not permitted to take part in any grading without the written consent of the SKIF Ireland National Committee and their own SKIF National Committee. Dojo Instructors: Head Instructor of clubs that have an excess of €400 student contribution for the seminar will have complimentary entry to the seminar. Note club contribution must still be above €400 when insructor fee removed. No instructor in the country will have free entry unless their dojo meets this threshold regardless of position in organisation. No tickets will be issued for this seminar. SKIF Ireland students must present their New SKIF Ireland Licence to gain entry to the training venues. Student Names and Fees to be collected by clubs in the Seminar Spreadsheet and submitted to SKIF Ireland Treasurer in advance of the seminar. Please note we are actively trying to move away from Cheque / Bank Draft / Postal Order Payments and would prefer Clubs to make an electronic transfer direct to the SKIF Ireland Bank Account. Please see details below. For further information, please contact the Treasurer Aaron Kenneally on 0876307006.
a full breakdown for accounting purposes. of the fee your transferring for accounting purposes. 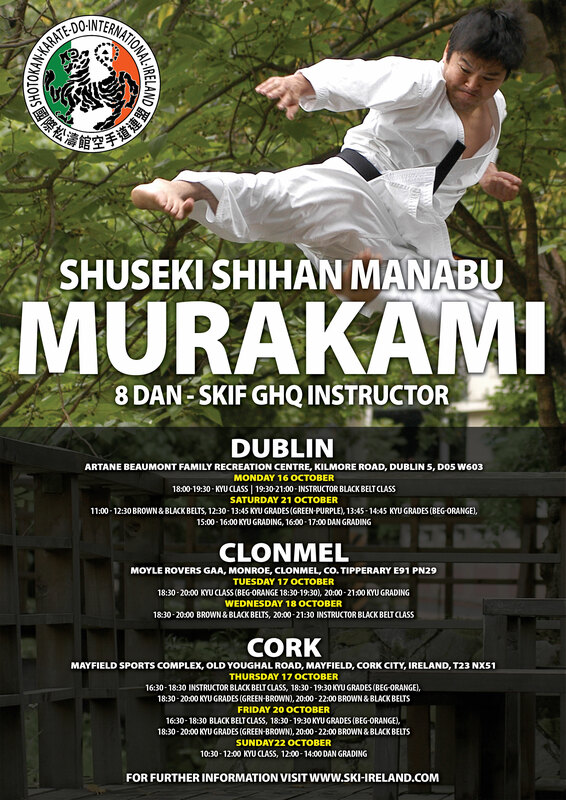 Dan Application forms are to be submitted at the SKIF Ireland National Pre-Grading. Dan Application Payments must be sent to the treasurer’s address once approval has been granted by the SKIF Ireland National Grading Panel. DO NOT SEND CASH IN THE POST AS SKIF IRELAND WILL NOT BE RESPONSIBLE FOR ANY LOSS OF PAYMENT due to postal error. IMPORTANT: Please ensure you print your name clearly IN BLOCK CAPITALS on all Dan Applications forms as these forms will be sent to SKIF Headquarters in Tokyo Japan and will be used to create your SKIF Diploma, if SKIF GHQ cannot read your hand-writing there is a chance there will be an error in your Diploma so please ensure it is very clear to read. Please ensure you are present to collect your diploma at the next seminar.